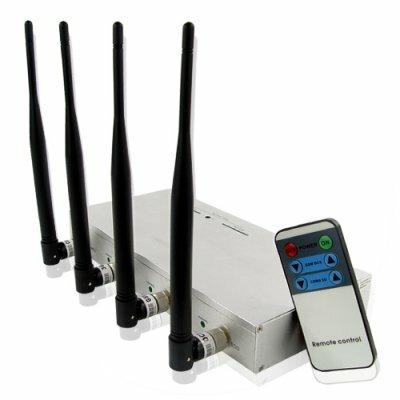 Successfully Added High Power Mobile Phone Jammer with Strength Remote Control to your Shopping Cart. Are you sick of those pesky mobile phone ring tones and MMS tones during your presentations and meetings? Silence everything, with this handy high powered mobile phone jammer your meeting room or presentation hall will be whisper quiet. With completely silent operation and adjustable strength for each band, the versatility is there to only block the phone carriers you don't like. A well built heat dissipative design ensures that this unit will not over heat during the meeting and a typical range of 20 meters will make sure you silence even the far reaches of the room. Buy this great jammer to day at fantastic wholesale prices from Chinavasion and get shipped directly to your door from China, or direct to your customers doors using our drop shipping service. on 2010-04-13 00:35:38 Highly recommended! Performs as promised. Flawless quality. Strategically placed, I actually manage to block out quite more than the specified max range. ChinaVasion is the best thing to buy. Fast shipment. Very Good product. Good Price. I recommend it.